I am looking into the possibility to use multiple iBeacons to do a 'rough' indoor position location. The application is a kind of 'museum' setting, and it would be easier to be able to form a grid with locations for the different objects then individual beacons (although that might not be impossible too). Are there examples, experiences, with using multiple beacons to triangulate into some kind of location, or some logic to help me on the way to write it myself? I have been making some experiments to get a precise position using three beacons. In non-controlled environments, where you can find metals, and other objects that affect the signal, the received signal strength of the beacons changes so often that it seems impossible to get error range below 5 meters. Depending on the way that the user is handling the receiver device, the readings can change a lot as well. If the user puts his/her hand over the bluetooth antenna, then the algorithm will have low signals as input, and thus the beacons will supposed to be very far from the device. 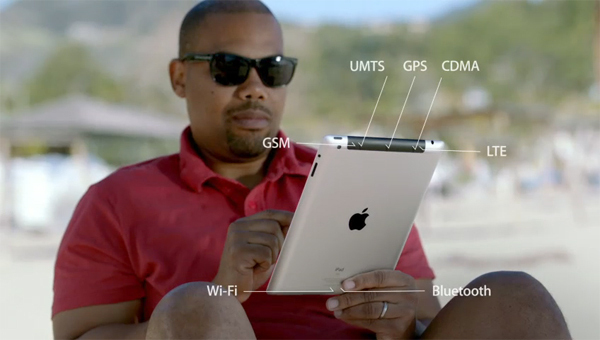 See this image to see the precise location of the Bluetooth antenna. After talking with an Apple engineer who actively discouraged me to go down this way, the option I feel more inclined to use right now is brute force. Try to set up a beacon every X meters (X being the maximum error tolerated in the system) so we can track on this beacons grid the position of a given device by calculating which beacon on the grid is the closest to the device and assuming that the device is on the same position. However, for the sake of completeness, I share below the core function of the trilateration algorithm. It's based on the paragraph 3 ("Three distances known") of this article. It uses a popular nonlinear least squares optimizer, the Levenberg-Marquardt algorithm, from Apache Commons Math. Most scholarly examples, like the one on wikipedia, deal with exactly three circles and assume perfectly accurate information. These circumstances allow for much simpler problem formulations with exact answers, and are usually not satisfactory for practical situations. The problem in R2 or R3 euclidean space with distances that contain measurement error, an area (ellipse) or volume (ellipsoid) of interest is usually obtained instead of a point. If a point estimate is desired instead of a region, the area centroid or volume centroid should be used. 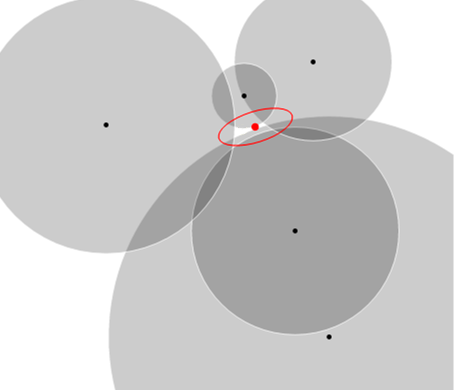 R2 space requires at least 3 non-degenerate points and distances to obtain a unique region; and similarly R3 space requires at least 4 non-degenerate points and distances to obtain a unique region. I looked into this. The term you want it trilateration. (In triangulation you have angles from 3 known points. In trilateration you have distance from 3 known points) If you Google it you should find several articles including one on Wiki. It involves solving a set of 3 simultaneous equations. The documents I saw were for 3D trilateration - 2D is easier because you can just drop the Z term. What I found was abstract math. I haven't taken the time yet to map the general algorithm into specific code, but I plan on tackling it at some point. Note that the results you get will be VERY crude, especially in anything but an empty room. The signals are weak enough that a person, a statue, or anything that blocks line of sight will increase your distance readings pretty significantly. You might even have places in a building where constructive interference (mostly from the walls) makes some places read as much closer than they actually are. iBeacon's beaconing frequency probably cannot be higher than 1Hz. I will be glad if anyone can point to source that says otherwise, but all information I've seen so far confirms this assertion. That actually make sense since most iBeacons will be battery powered and high frequency significantly impact the battery life. Considering people's average walking speed is 5.3km (~1.5m/s), so even if you just use a modest 3 beacon packets to do the averaging, you will be hard to get ~5m accuracy. On the other hand, if you could increase iBeacon frequency to larger than 10Hz (which I doubt is possible), then it's possible to have 5m or higher accuracy using suitable processing method. Firstly trivial solutions based on the Inverse-Square Law, like trilateration, is often not performing well because in practice the distance/RSSI relationship for different beacons are often way off from the Inverse-Sqare Law for the reason 1 above. But as long as the RSSI is relatively stable for a certain beacon in any certain location (which usually is the case), you can use an approach called fingerprinting to achieve higher accuracy. A common method used for fingerprinting is kNN (k-Nearest Neighbor). Some iBeacons can broadcast more than 1Hz, like Estimote use 5Hz as default. However, according to this link: "This is Apple restriction. IOS returns beacons update every second, no matter how frequently device is advertising.". There is another comment there (likely from the Estimote vendor) saying "Our beacons can broadcast much faster and it may improve results and measurement". So whether higher iBeacon frequency is beneficial is not clear. If you're anything like me and don't like maths you might want to do a quick search for "indoor positioning sdk". There's lots of companies offering indoor positioning as a service. Shameless plug: I work for indoo.rs and can recommend this service. It also includes routing and such on top of "just" indoor positioning. //Convert shortest distance in meters into coordinates units. //Add t times diff with nearestBeacon to find coordinates at a distance from nearest beacon in line to COG. add the delta with the nearest beacon x,y. After testing it, I found it accurate to 5 meters. Please comment me your testing, if we can refine it. nearly 10 wifi AP nearby. several other Bluetooth signals nearby. sampling with the map for all the pending positioning point. record all the sampling data, the data should include: map coordinate, position signals and their RSSI. so when you start positioning, it's just a reverse of proceeding steps. Although in theory 3 iBeacons should be enough to achieve a good precision, maybe in real world situations more beacons are needed to ensure the precision you are looking for. The thing that really helped me was this project on Code.Google.com: https://code.google.com/p/wsnlocalizationscala/ it contains lots of code, several trilateration algorithms, all written in C#. It's a big library, but not really meant to be used "out-of-the-box". Proximi SDK will take care of the triangulation. This SDK provides libraries for handling all the logic for beacon positioning, triangulation and filtering automatically in the background. In addition to beacons, you can combine IndoorAtlas, Wi-Fi, GPS and cellular positioning. I found Vishnu Prahbu's solution very useful. I ported it to c#, if anybody need it. Not the answer you're looking for? Browse other questions tagged bluetooth-lowenergy ibeacon or ask your own question. Finding center of 2D triangle?